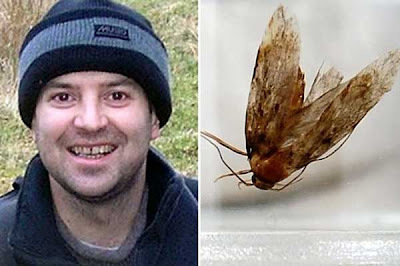 A man had to undergo surgery to remove a live moth from his ear which had been buzzing inside his head for three days. Rob Fielding, 43, of Aylesbury in Buckinghamshire was reading in bed when the insect perched on his ear. He instinctively reached up to poke it away but ended up pushing the insect into his ear canal. After three restless days, his wife sent him to hospital for an examination. The insect was eventually removed during a 90-minute operation where his ear canal was prised open and the moth pulled out with a tiny pair of forceps. Rob now displays the dead insect on his mantlepiece as a souvenir of the ordeal. He said: "It was awful knowing the moth was flying around inside my head and every now and then when I felt it move, it made me jump out of my skin." It wasn't flying around inside your head, and you waited three days to have it removed. Great nightmare material. I can't understand how he could stand it for three days.